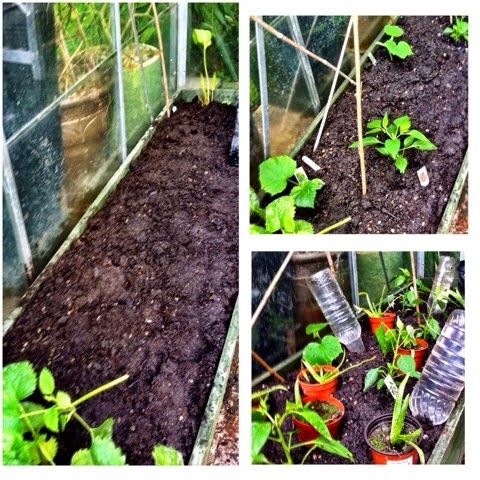 Before we headed to Portugal I had some prep work to do with my veg plants as the tomatoes, cucumber, chillies and peppers were still sitting snugly in the greenhouse. If the weather turned nice while we were gone, I knew they wouldn't survive. That meant prepping my greenhouse bed, adding some mulch and compost to it before planting the cucumbers, chillies and peppers in it and giving each of them their own little water reservoir made of an old plastic bottle with holes pierced into the cap, filled with water and plunged into the soil and with luck they'd do their job. For the tomatoes I potted them on and hoped the time they'd been spending out of the greenhouse each day would be enough to prepare them for permanent outdoor living. Then I placed them on an old wet towel - laced with slug pellets - to give them some water, knowing that the towel would take a while to dry out and would retain any rainwater far longer than newspaper would. It's practical and functional, but not very pretty! As you can see I left the greenhouse door open but left some old mushroom crates in the doorway as a deterrent for anything that might have fancied some shelter. I'm not sure if it really was much of a deterrent, but it made me feel better! The Borlotti beans, which were just peeking through also got the personal water reservoir treatment. In the main, it did. All my plants survived - I know there was some rain while we were away so that will have helped - but even so, some of my plants even flourished! Some of my climbing beans failed to germinate, and since we've been back I've planted some more so hopefully these will fare better. 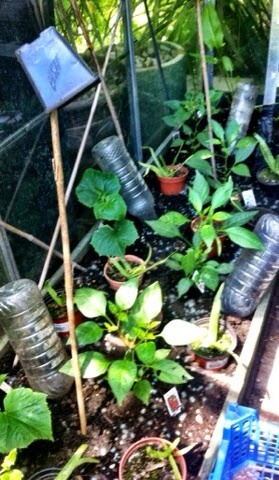 But the greenhouse reservoirs were empty and the plants had grown. And there were even flowers on the chillies and peppers. 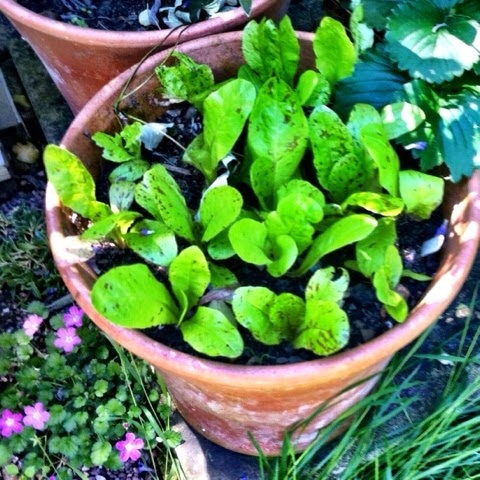 The lettuces were growing well. And the tomato towel had done its job. And the Borlotti beans were starting to wind their way up the frame. Elsewhere in the garden there were successes and some thirsty plants! The angelicas needed some water to revive them. But the sweet peas had shot up - and they've continued to grow, but still no flowers yet! They're late this year. The Philadelphus was starting to flower and fill the end of our garden with its white flowers and scent and the pink jasmine was just coming into bud. The local wildlife had also made their mark. 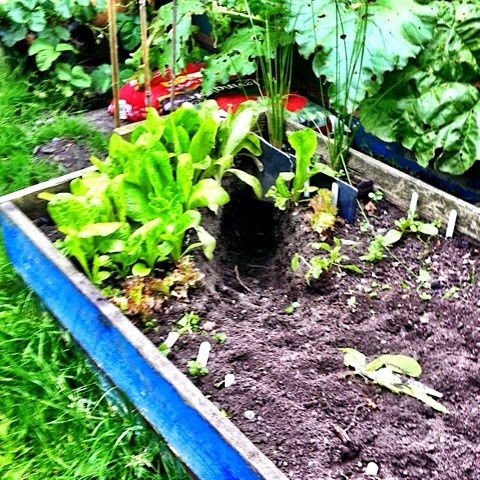 Something - I think, but don't know for sure, a fox - had dug under my veg bed. After getting MOH to poke a long stick into the hole - I'm brave like that - and once we were sure there was no sign of life I filled the hole back up. 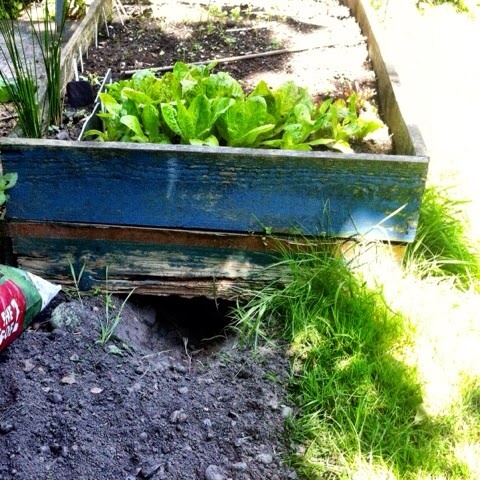 Not only had the hole reappeared from the other side, this time lettuces had also been cast aside and my other seedlings had either been displaced or covered over. Most of the lettuce remain ok and the coriander and some dwarf beans survived - others may also have survived. I guess I'll find out as they grow! 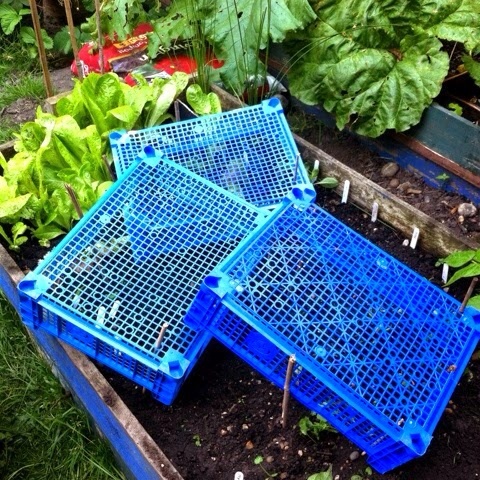 But this year I don't think I'll be having the neatly organised veg bed I'd hoped for! Not to be outfoxed by the wildlife I made my countermove - with imaginative use of the old mushroom boxes and bamboo canes - which has so far remained in place. No doubt the wildlife is regrouping and planning its next move.